M Aziz, M Pipon, N Subhedar. Neonatal Hypertrophic Cardiomyopathy In An Infant With Osteogenesis Imperfecta Type I. The Internet Journal of Cardiology. 2001 Volume 1 Number 2. We report an association between neonatal hypertrophic cardiomyopathy and osteogenesis imperfecta type I. A preterm infant with cardiorespiratory distress was noted to have severe hypertrophic cardiomyopathy in the early neonatal period. She was treated with b-blockers and had gradual complete resolution of abnormal left ventricular and septal echocardiographic indices over the next four weeks. She had no clinical features directly attributable to her cardiomyopathy during this time. Subsequently, evidence of bone fragility led to a diagnosis of osteogenesis imperfecta type I being established. Neonatal hypertrophic cardiomyopathy (HCM) is commonly described in infants of diabetic mothers in whom hyperinsulinemia may contribute to the development of transient asymmetrical septal hypertrophy. It has also been described in neonates given prolonged course of corticosteroids. Other associations with neonatal HCM include several inborn errors of metabolism, such as glycogen storage disease type II, GM1 gangliosidosis and mucolipidosis type II, rhabdomyomatous tumour infiltration, Noonan syndrome and Beckwith-Wiedemann syndrome. In contrast, primary HCM manifests itself during childhood and adolescence, but usually not during neonatal period. Osteogenesis imperfecta (OI) is a hereditary skeletal condition characterized by reduced or modified collagen synthesis, leading to susceptibility to fracture and skeletal deformity. It is divided into four major sub-types. Osteogenesis imperfecta type I is the commonest variety and characterised by osteoporosis, bone fragility, blue sclerae and conductive hearing loss. Previous workers have reported the association of OI with various cardiovascular conditions. We report a preterm infant in whom HCM was identified in the early neonatal period with a diagnosis of OI type I being made only several weeks later. A female infant of 32 weeks gestation was born weighing 1.72 kg to a 26 year-old primigravida by breech vaginal delivery after uncomplicated pregnancy, except for brief vaginal bleeding at 20 weeks' gestation. The mother was given a single dose of betamethasone during labour. The baby was initially resuscitated with bag and mask ventilation, but subsequently required intubation because of poor respiratory effort. Respiratory distress syndrome was confirmed radiologically and she was mechanically ventilated with moderate respiratory support requirements. She was noted to have a systolic murmur at the left sternal edge on day 2. Echocardiography demonstrated a moderate patent ductus arteriosus (PDA) with minimal left to right shunt. Cardiac anatomy was otherwise normal. Repeat echocardiography 2 days later revealed a large PDA, diameter 3.5 mm on colour flow mapping with a LA/Ao ratio of 1.6 suggesting significant left to right shunting. She remained ventilator dependent for 7 days and required supplemental oxygen therapy until 19 days of age. Echocardiography on day 11 showed moderate PDA with low velocity, suggesting the development of pulmonary hypertension. On day 16 echocardiography revealed severe symmetrical biventricular hypertrophy, but good left ventricular function (FS 35%). Blood pressure was 79/64 mm Hg. She was started on Propranolol with gradual resolution of abnormal echocardiographic features over the next 3 to 4 weeks (see table). Propranolol was discontinued on day 35. Echocardiography on day 37 of age demonstrated normal ventricular dimensions and function. This was confirmed on re-examination on day 71. Large bilateral intraventricular hemorrhages also complicated her early neonatal course. She subsequently developed post-haemorrhagic ventriculomegaly, which was treated successfully with insertion of ventriculoperitoneal shunt. She was finally discharged home on day 70, at 2 weeks of age corrected for prematurity. She was readmitted the next day after she was noted on routine examination to have bilateral dislocation of the hip. A skeletal survey performed at that time revealed poor generalized bone mineralisation with several fractures of both femora and lumbar vertebrae. There was no biochemical evidence of metabolic bone disease of prematurity. On further detailed examination, both baby and mother examined were noted to have blue sclerae; the mother also had opalescent dentition and facies typical of OI. The diagnosis of OI type I was confirmed by a clinical geneticist. We have reported a case of a premature infant with early cardiorespiratory distress and echocardiographic evidence of non-obstructive HCM. Although her echocardiographic features resolved with -blocker therapy, a diagnosis of OI type I was subsequently established. Other common causes of neonatal HCM include maternal diabetes and prolonged corticosteroid therapy; neither of these explanations are directly relevant to our case since the mother was not known to be diabetic and the baby had not been given postnatal corticosteroids. In addition, there was no family history of primary HCM and this would be an unusual presentation of this condition in the early newborn period. The transient nature of the abnormal echocardiographic features in our patient also make the diagnosis of primary HCM unlikely. Although Eidem and colleagues recently described resolution of HCM in a baby born to a mother with familial HCM, suggesting that primary cardiomyopathy may resolve, these observations have not been confirmed by others. Furthermore, the authors themselves suggested the possibility of an alternative diagnosis because of the presence of other unusual features such as skin laxity, joint hypermobility and facial dysmorphism in the same child. A complete metabolic screen was not performed in this infant since there was no evidence of hypoglycaemia or acidosis. It is possible, but unlikely, that this child has both OI type I and a separate asymptomatic metabolic disorder accounting for her cardiomyopathy. However, she has remained well since discharge from hospital, except for her ongoing orthopaedic problems. We therefore believe this case represents a cardiac manifestation of OI type I which has not been described previously in the early neonatal period. Osteogenesis imperfecta should be considered in the differential diagnosis of a newborn infant with hypertrophic cardiomyopathy. 1. Breitweser JA, Meyer RA, Sperling MA, et al. Cardiac septal hypertrophy in hyperinsulinemic infants. J Pediatr 1980; 96: 535-539. 2. Bensky AS, Kothadia JM, Covitz W. Cardiac effects of dexamethasone in very low birth weight infants. Pediatrics 1996; 97: 818-821. 3. Denfield SW, Gajarski RJ, Towbin JA. Cardiomyopathies. In: Garson A, Bricker JT, Fisher DJ, Neish SR, eds. The science and practice of pediatric cardioogy. Second edition. Baltimore: Williams & Wilkins, 1998: 1851. 4. Sillence DO. Disorders of bone density, volume and mineralization. In: Rimoin DL, Connor JM, Pyeritz RE, eds. Principles and practice of medical genetics. Third edition. New York: Churchill Livingstone, 1996:2817. 5. Byers PH, Steiner RD. Osteogenesis imperfecta. Ann Rev Med 1992; 43: 269-282. 6. White NJ, Winearls CG, Smith R. Cardiovascular abnormalities in osteogenesis imperfecta. Am Heart J 1983; 106: 1416-1420. 7. Vetter U, Maierhofer B, Muller M, et al. Osteogenesis imperfecta in childhood: cardiac and renal manifestations. Eur J Pediatr 1989; 149: 184-187. 8. Hortop J, Tsipouras P, Hanley JA, Shapiro JR. Cardiovascular involvement in osteogenesis imperfecta. Circulation 1986; 73: 54-61. 9. Eidem BW, Linodor NM, Driscoll DJ. Resolution of neonatal hypertrophic cardiomyopathy in an infant with an affected mother. Pediatr Cardiol 1999; 20: 208-211. 10. Walther FJ, Siassi B, King J, Wu PYK. 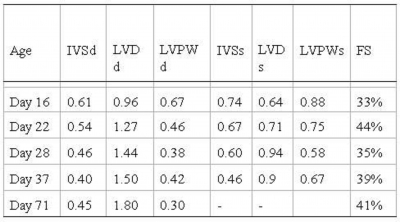 Echocardiographic measurements in normal preterm and term neonates. Act a Paediatr Scand 1986;75:563-568.